Join us for the second annual (East of the White House) Annapolis Easter Egg Roll! This free event will feature an Easter egg hunt starting at 9:30am, an Easter egg roll starting at 10:00am, and egg dyeing and crafts under the pavilion throughout the morning. Truxtun Park Boat Ramp & Pavilion (at the end of Truxtun Park Road). Parking is available in the lot immediately before the pavilion. Sponsored by Senator Sarah Elfreth, Alderwoman Shaneka Henson Ward 6, and Alderman Marc Rodriguez. District 30A Night in Annapolis! Please join us at the new Market House to raise a toast to District 30's new Senator-elect, Sarah Elfreth! Special thanks to hosts: Mayor Gavin Buckley, Jennifer Navabi, and MSEA Fund for Children & Public Education! Please join Senator-elect Sarah Elfreth for a town hall listening session to help set a legislative agenda based on our community’s priorities. Bring your ideas! Please join Speaker Mike Busch, Senator-elect Sarah Elfreth, and Delegate-elect Alice Cain for a town hall listening session to help us set a legislative agenda based on our community’s priorities. Bring your ideas! Deale & Shady Side Canvass! Early voting begins Thursday and Steuart, Sarah, James, and Mike need your help knocking on doors and talking to voters in Deale, Shady Side, and Churchton this Sunday! Early voting begins this week and Steuart, Sarah, Mike, and James need your help in a final push to talk to voters! Join us at the Old Stein Inn to launch the canvass for neighborhoods in Mayo & Edgewater. Help us Get Out the Early Vote with Speaker Mike Busch, Sarah Elfreth for Senate - District 30, Alice Cain For Delegate, Steuart Pittman for County Executive, and Lisa Rodvien for County Council this Saturday, Oct. 27th at 10:00am at our office at 147 Old Solomons Island Road, Suite 200. We'll be joined by special guest Senator Chris Van Hollen and will launch the canvass and phonebank to remind folks about Early Voting. Early Voting Phone Bank Party! As we get close to Early Voting (10/25 though 11/1) and Election Day (11/6), reminding our voters who to vote for and when and where to vote becomes a front and center task. We need as many phoners calling to get out the vote as possible for our Team 30 candidates: Speaker Mike Busch, Sarah Elfreth for Senate - District 30, Alice Cain For Delegate, Steuart Pittman for County Executive, Lisa Rodvien for County Council. We hope you will join us for our regular phone banks every Tuesday, Thursday and Sunday and for our special Phone Bank Party the night before Early Voting begins on Wednesday, October 24, 2018. 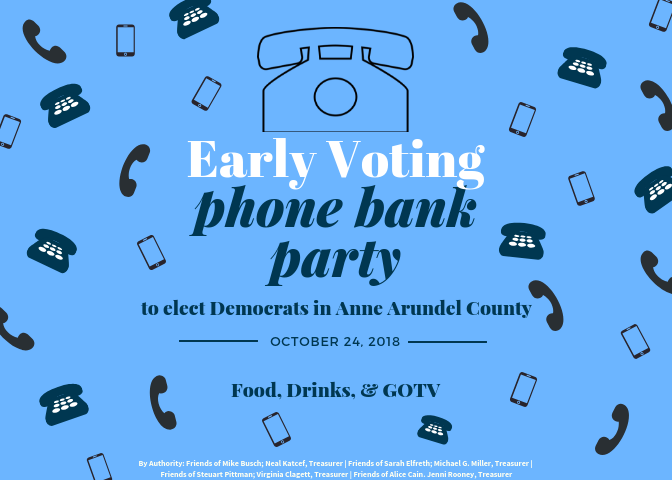 Phone Bank Party with the D30 Democratic Club on Wednesday, 10/24 from 5:30 - 9:00 PM at the Team 30 Campaign office at 147 Old Solomon's Island Road, Suite 200, Annapolis 21401, to urge supporters to Early Vote starting the next day. Join Senator Ben Cardin & Volunteer for Team 30! We're coming down to the wire! 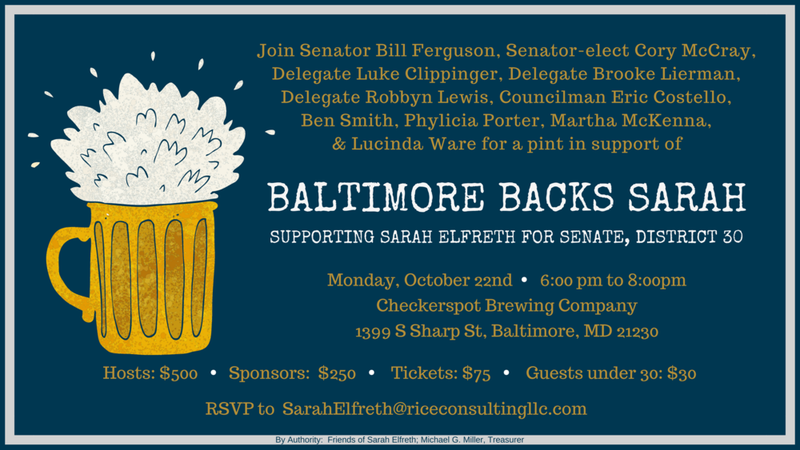 Join Senator Ben Cardin to help get Speaker Mike Busch, Sarah Elfreth for Senate - District 30, Alice Cain For Delegate, Steuart Pittman for County Executive, and Lisa Rodvien for County Council across the finish line by knocking on doors and talking to voters about investing in our schools, cleaning up our Bay, and building an economy that works for everyone! We'll have donuts, coffee, and a walk pack waiting for you at 9:30am every Saturday morning. Volunteer for Mike, Sarah, Alice, Steuart, & Lisa! With less than a month until Election Day, Speaker Mike Busch, Sarah Elfreth for Senate - District 30, Alice Cain For Delegate, Steuart Pittman for County Executive, and Lisa Rodvien for County Council need your help to knock on doors and talk to voters! Take advantage of this chance to meet the candidates, ask questions, get to know them. Annapolis Roads: Meet Sarah & Alice! There are less than two months until November's General Election! Join hosts Carroll & Rob Greves to meet Sarah Elfreth for Senate - District 30and Alice Cain For Delegate, hear about their priorities, and discuss ways we can strengthen our community together. Join us to help celebrate Sarah's 30th birthday in (very casual Annapolis) style! Edgewater: Meet Sarah for Senate! Join host Clare Vanderbeek to meet Sarah Elfreth for Senate - District 30, hear about Sarah's vision for District 30, and discuss ways we can strengthen our community together. Eastport: Meet Sarah for Senate! Polls open in just two months! 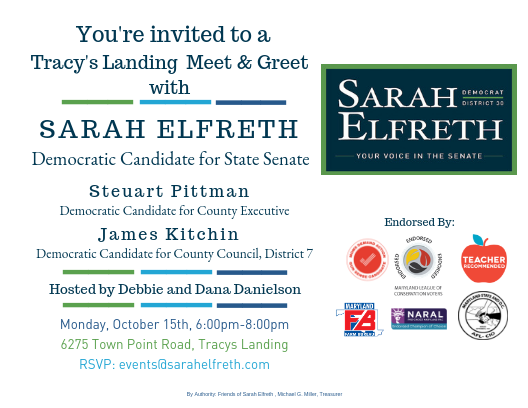 Join host Sharon Murray to meet Sarah Elfreth for Senate - District 30 in Eastport and discuss ways we can improve our community together. 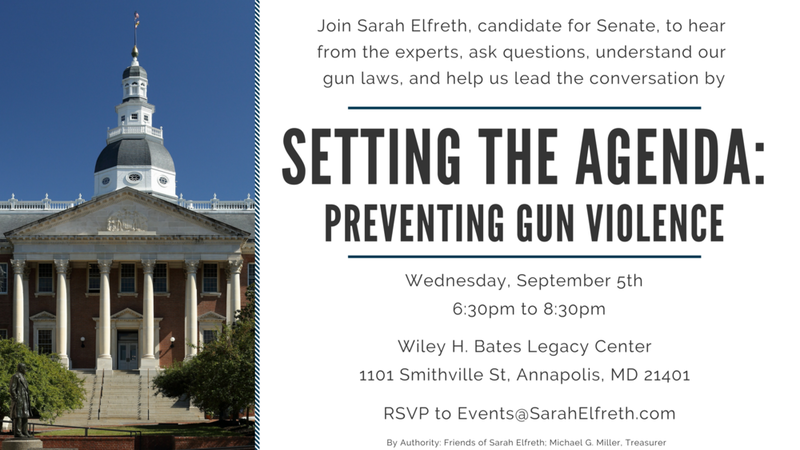 Hear from groups such as Moms Demand Action for Gun Sense in America, Marylanders to Prevent Gun Violence, and Everytown for Gun Safety, ask questions of the experts, and help us lead the conversation. Canvass & School Supply Drive! The General Election is rapidly approaching and we need your help to keep District 30 blue! Join us to knock on doors and talk to voters on behalf of Speaker Mike Busch, Sarah Elfreth for Senate - District 30, Alice Cain For Delegate, and Steuart Pittman for County Executive! We'll have Carlson's donuts, coffee, and a walk pack waiting for you at 9:30am every Saturday morning. We're also collecting school supplies - notebooks, pens, color pencils, and book bags etc. - for the children of Obery Court. We have just a few months to flip South County blue by knocking on doors and talking with voters! 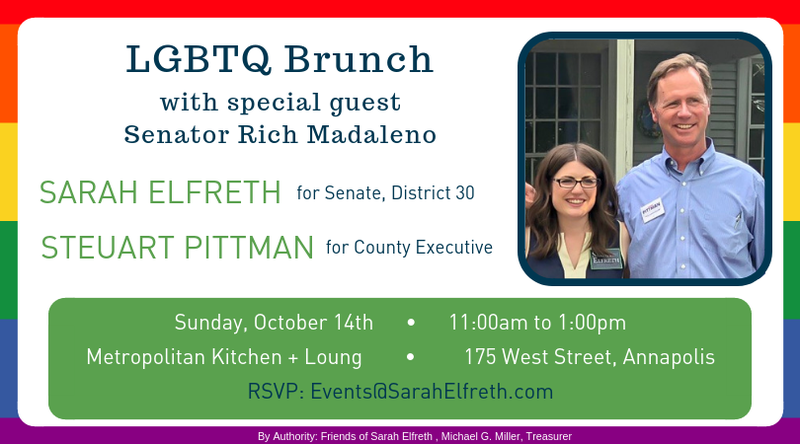 Please join Sarah Elfreth for Senate - District 30, Steuart Pittman for County Executive, Mike Shay for Delegate, and James Kitchin for County Council every Sunday at 1:00pm. Go Green Vote Blue Fundraiser in support of green champion, Sarah Elfreth for District 30 State Senate.